In the last section you learned that I was making about $600 per book ($80 PFH), when I first started narrating audiobooks. Not bad. But not great either. These flat rate (PFH) payments are nice because you know EXACTLY how much you'll earn. There are no surprises. No risks. But there is a downside --> your income is limited by your hourly rate. With royalty share (RS) books, your earnings are based on how many copies the book sells, NOT on how long the book is. When I found out about this, my goal changed from trying to get as many PFH books as I could, to trying to figure out which RS books had the potential to pay out the most over time. My average royalty per sale for a 7 hour book is $2.25. My average flat rate payment per book is $600 ($80 PFH). At this rate, the book would need to sell 266 copies to break even ($600/$2.25 = 266). Anything above 266 sales would be passive income. My goal is always to "break even" within one year. Therefore, the book would would need to sell an average of 22 copies per month. When I'm researching projects, I always want to consider whether a book has the potential to pass the PFH "break even" point within a year. ==> If yes, then a royalty share deal makes sense because I'll end up earning more in the long run. ==> If no, then I'm better off taking the one-time PFH payment. In a moment I'll show you exactly what I look for when researching books, because NOT all books will sell this well. You have to know what you're looking for. But first, let's take a look at a few examples of how we can use this data to create a passive income plan. Planning and goal setting are incredibly important. Without clear, measurable goals and a plan to achieve them, you won't get very far. Results don't happen because of magic or luck. They happen when you define a goal and then create a realistic plan to achieve the desired result in a set amount of time. Let's create a goal right now. We'll pretend that our goal is to build a passive income stream that earns you $1,000 per month. ==> How many books will you need to record to reach this goal? We'll use my "break even" numbers. 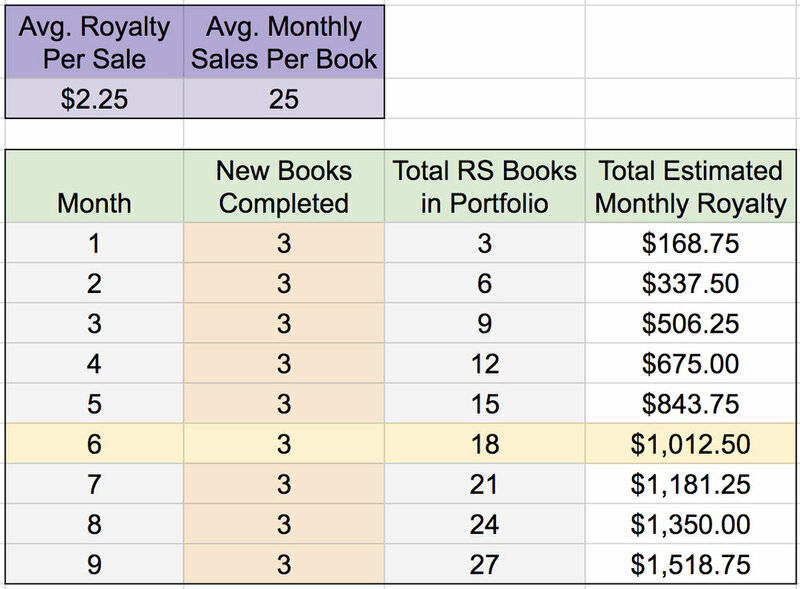 Assuming you receive $2.25 per sale and each RS book sells an average of 25 copies per month, you would earn an additional $56.25 each month for every book you complete. To get to $1,000 per month at this rate, you would need to complete 18 books. ==> How long will this take you to accomplish? If you recorded just 2 books a month, it would take you 9 months to reach $1,000 of recurring monthly passive income. We can play around with these numbers to achieve results faster or slower by pulling different "levers." 3) Number of sales per month. By pulling this one lever, you can reach $1,000 recurring monthly royalties in six months instead of nine. But three books a month is a lot for most people to handle, especially if you're just getting started. So, let's put the number back down to two books per month, but let's pull the "book length" lever and see what happens. Generally, the longer the book is, the more your royalty per sale will be. Let's say that instead of $2.25 per sale, you record longer books that earn you $3.99 per sale. Under this scenario, you could potentially hit your goal in month 5. We could keep running the numbers on different scenarios all day long, but the point of this exercise is to be aware of the different variables or "levers" that will effect your results so that you can create a plan that works for you. Many new narrators pick royalty share books because they "seem interesting" and then hope for the best. This "plan" usually leads to disappointment when they get their royalty statement at the end of each month. Some narrators have even written off royalty share books altogether. "Hoping for the best" is not a viable plan. When you don't know what to look for (and what to avoid) you make mistakes. There's nothing wrong with making mistakes, per se. But I'd like to help you avoid as many as possible if I can. Just because a book "looks interesting" does not mean that it's going to sell well. If you're just doing this for fun and don't care about your return on investment, by all means, ignore what I'm about to tell you. But if you're serious about executing a plan that get results, then you need to make your decisions based on data and logic. There are four factors or "data points" that I always look at before agreeing to work on a royalty share book.